Starting 2008, we have been digitally recording all our meetings and presentations for distribution to members unable to attend, streaming them live on the website here. 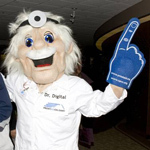 Dr. Digital is PCCN Calgary's mascot. His job is to help build awareness of the need for early detection of prostate cancer and is available to appear at your special function, parade, or community event. For more information and availability, please contact us. Prostate Cancer Canada Network Calgary has professonally designed and produced free standing display units for use at health fairs, in shopping Malls, at sporting events or wherever people gather. If you would like more infomation on hosting an awareness event for prostate cancer please contact us.